Today we’re announcing a chipset update to ODAC. Revision B improves general reliability, while meeting or exceeding the original performance criteria set forth by NwAvGuy. This announcement will come as a surprise to many, considering ODAC was declared as the be-all and end-all of DAC transparency by a now absent engineer. This article explains who owns the ODAC design, why an update is prudent, and how ODAC Revision B’s objectivity has been exhaustively verified. Scroll towards the end for benchmarks, or read on for the full story. ODAC was released on May 9, 2012, shortly before NwAvGuy vanished from the community. While his name is closely tied to ODAC, it’s critical to understand that ODAC was jointly developed by NwAvGuy and Yoyodyne Consulting. 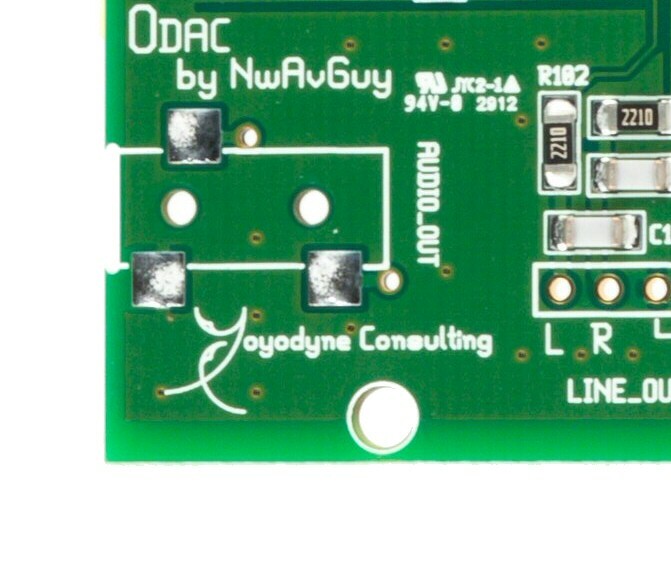 Yoyodyne generated ODAC’s schematic and PCB, and NwAvGuy provided prototyping feedback and performance analysis. Yoyodyne also generated the project title, “ODAC” in 2011 and has remained responsible for all production engineering and distribution of the project to end retailers like JDS Labs and our counterparts. In other words, ODAC was benchmarked and certified Objective by NwAvGuy; Yoyodyne generated the design and controls its manufacturing to this day. NwAvGuy’s name has been intentionally omitted from ODAC RevB, so as not to imply an ongoing collaboration. Our job is to deliver perfect audio performance to every user. We’ve hit this goal for 99.5% of ODAC users out of the box, and have found a way push ODAC’s reliability and objectivity to an even higher standard. Increasing demand over time is amazingly rare for electronic production, and is a testament to ODAC’s positive reception. Although ODAC has proven itself in the audio community, JDS Labs and fellow retailers have observed lower than expected yield (<1% DOA units), higher than expected long-term failure rates (< 2%), and an ongoing USB hub issue that NwAvGuy did not have an opportunity to address before his 2012 departure. One of the first bits of ODAC feedback we received in 2012 revealed odd behavior: severe distortion, completely resolved by a USB hub. This peculiarity would ultimately affect less than 0.5% of all users, and the simple USB hub solution became well known within the audio community (later published to ODAC’s operating instructions). 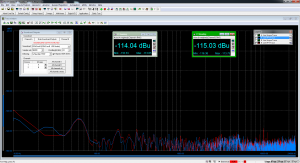 We invested in a dScope Series III audio analyzer in 2012 and verified ODAC’s performance. The behavior was later identified as a power supply regulation design choice made by NwAvGuy. ODAC performs consistently with all devices, unless the host USB bus has remarkably low ESR ceramic capacitors placed too closely to the USB 5V output pin (rare). When ODAC is connected to such a host computer, ODAC’s 3.6V linear regulator performance plummets from 100% stable operation to extreme oscillation, which turns the perfect audio signal into garbage (lots of very audible distortion). There is no in-between. The regulator is either 100% stable, or 0% stable. Consequently, we’ve offered support for this rare behavior since 2012. So, ODAC performs as described for about 99.5% of users. As demand grows, that USB bug becomes increasingly pronounced. Add in 1-2% DOA and long-term ES9023 failures, and ODAC retailers have growing collections of bad ICs. DOA boards are easy to catch via quality control, but long-term failures require frustrating warranty service. Meanwhile, JDS Labs and Yoyodyne have engineered solutions to each reliability concern, meaning we can make ODAC reliable and objective for virtually 100% of users. Yoyodyne produced a series of ODAC RevB variants in 2014 with reliability fixes. 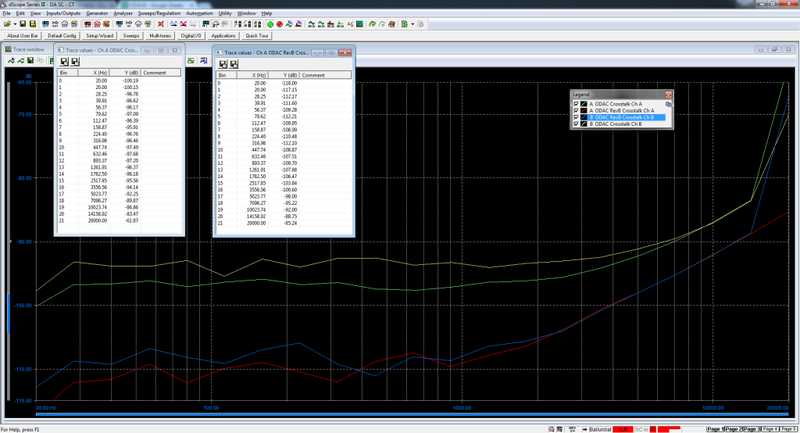 JDS Labs benchmarked each prototype to ensure equal or better performance compared to the original ODAC. Although the update was ready in late 2014, ODAC production runs occur about once annually. This long production cycle is best for the project, as it minimizes supply constraints and keeps distribution flowing smoothly to several O2/ODAC manufacturers. I think the community hoped NwAvGuy would return and publish necessary updates to O2/ODAC/ODA himself. At this point, a reliability update is the best judgment we can make for ODAC’s long-term success. Keep in mind that O2 is protected from derivatives by its license; ODAC is coordinated by Yoyodyne and nondisclosure agreements with its IC suppliers. Even so, we do not want to modify ODAC. Subjective bias is not trivial in the audio business. 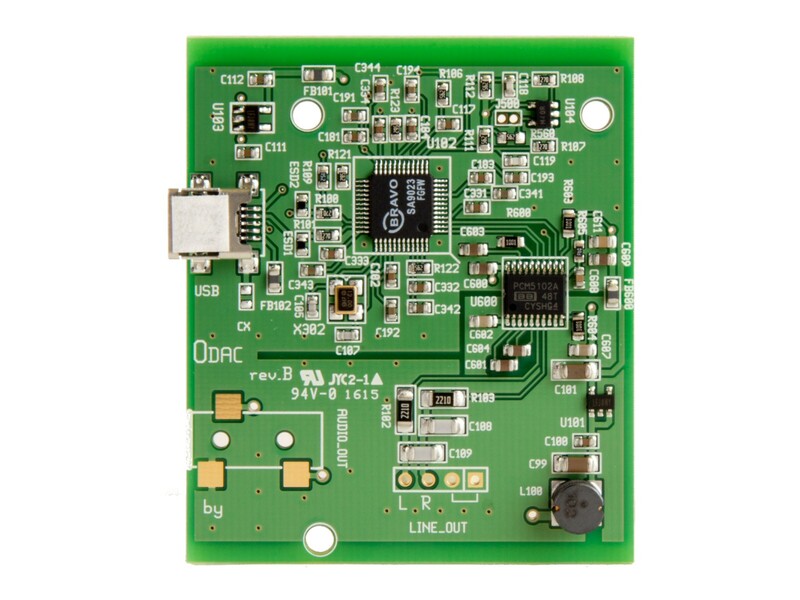 All of that being said, we’re confident ODAC RevB is a perfect reliability update. The newer DAC IC has proven reliable in other projects. In addition to thorough benchmarks, we’ve shipped ODAC RevB to a few users seeking support for their original ODACs. Feedback is perfect. We also shared ODAC RevB at the 2015 AXPONA tradeshow and allowed some random visitors to perform A/B tests. No one could differentiate. ODAC RevB resolves all reliability inadequacies of the original ODAC, while meeting or exceeding original transparency requirements. ODAC RevB utilizes the same PCB footprint and is a physical drop-in replacement to all existing ODAC and O2+ODAC assemblies. Revision B’s stronger output voltage of 2.10VRMS must also be accompanied by a slight DAC volume or gain adjustment when used in O2+ODAC; optimal gain is now 1.0/3.33x. ObjectiveDAC was designed for measurable and audible perfection. Reduced performance from ODAC RevB would be absolutely unacceptable, so we took great care in checking our work. Engineering test methods impact test results. While THD+N, frequency response, and crosstalk are straightforward, even these basic tests are impacted by audio analyzer setup parameters and real world hardware setup. Certain ferrites on the mini-USB cable improve dynamic range by up to 10dB versus an ordinary USB cable. More complex tests like Jitter and IMD produce surprisingly different results based on signal strength, averaging, etc.. As Yoyodyne and I analyzed performance of the original ODAC through a TDK ZCAT2035-0930 ferrite equipped USB cable via dScope audio analyzers, it was clear that NwAvGuy had utilized averaging and custom dScope routines. We would never be able to definitively duplicate his work due to unknown averaging, scripting variables, and exact ferrite type. To ensure a fair comparison, we measured a randomly selected ODAC production unit to establish baseline requirements. Measurements were repeated with two additional, randomly selected units to confirm consistency. 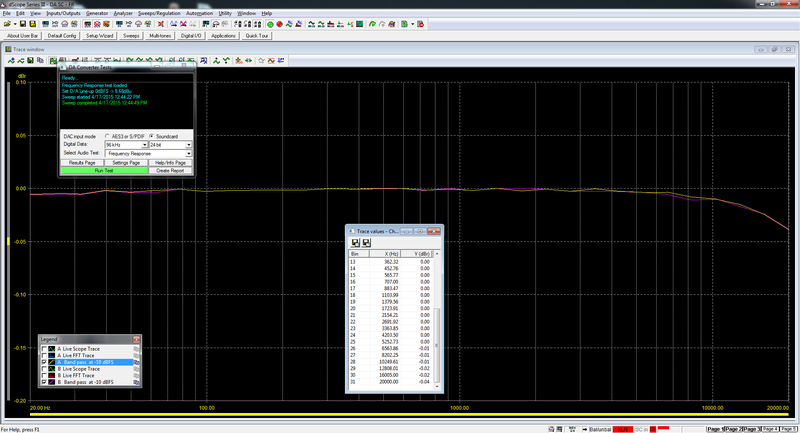 The exact same cable and test scripts were then repeated with ODAC revB. All tests are performed under a standard 100k load. In particular, please note that many of our measurements are taken at different signal strengths and sampling rates than used by NwAvGuy. Our table results are also taken without averaging; instead, we observe worst case performance over the course of 5 seconds of data collection. So do not be surprised that our baseline ODAC measurements reflect lower performance than NwAvGuy’s nicely averaged 2012 results! 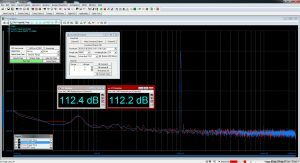 Frequency Response: NwAvGuy’s DAC Transparency Guideline calls for response of +/- 0.1 dB from 20 Hz – 19 kHz. RevB is slightly flatter than the original ODAC, exceeding the proposed transparency requirement for the complete audible range, 20 Hz – 20 kHz. THD+N: The original ODAC measures 0.0056% at 10kHz -0.15dBFS using our worst case scenario measurements (see above table). RevB manages just 0.0024% under the same condition. Shown below are THD+N -1dBFS, 8x averaged sweeps of each channel, directly comparing ODAC to ODAC RevB . The original ODAC’s right channel closely resembles NwAvGuy’s 2012 THD+N sweep, with a peak of 0.005% at 9kHz, and 0.004% at 10kHz. Note that the Left channel of the original ODAC differs from its Right channel in our sweeps. This observation is consistent across each unit tested from 2013 and 2014 production batches, despite no channel differences visible in 2012 benchmarks. RevB’s THD+N is consistent between Left and Right channels. Revision B also cuts THD+N in half at 10kHz, and remains below 0.0030% across the entire audible spectrum for each channel. Both versions are well below NwAvGuy’s suggested transparency limits (green line). Full-Scale Performance: Rumor suggests that PCM5102 clips at full scale. We first investigated this concern in 2013 with the then newly released PCM5102A. Empirical results show clean sine output at all frequencies. ODAC’s ES9023 reaches 1.99VRMS, and RevB’s PCM5102A generates 2.07VRMS at 0dBFS. Elevated THD at 0dBFS is consistent for all DACs we’ve measured, and is the reason engineers (including NwAvGuy) typically conduct DAC benchmarks at -1dBFS or -3dBFS. Simply put, digital to analog conversion is less ideal at 0dBFS. Any reasonable recording should be free of such peaks. At any rate, it’s ideal to slightly reduce DAC volume when listening to recordings containing frequent 0dB peaks. Noise: The newer PCM5102A DAC automatically enters a soft mute condition in the absence of an audio signal, pushing the measurable noise floor to an impressive -115dBu (near the dScope’s measurable limit). 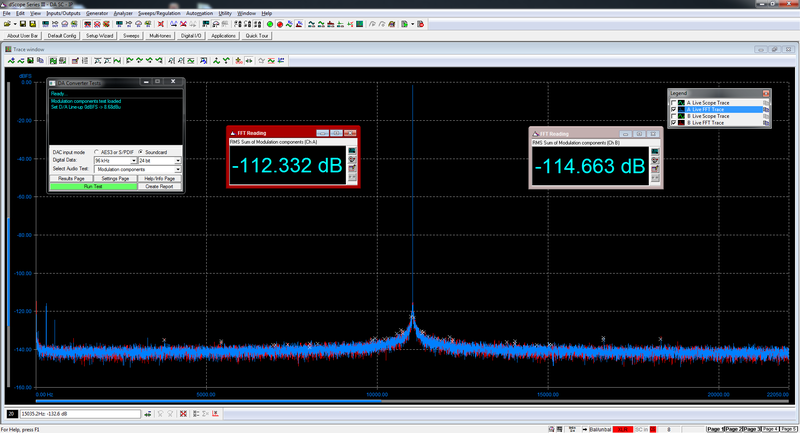 Therefore, noise was also measured with an applied -180dBFS, 20kHz signal, revealing the active state noise floor. RevB manages -103 dBu, slightly superior to the original ODAC’s -102 dBu. All noise components of RevB are well below the transparency requirement of -110dB for both mute conditions. Dynamic Range: RevB improves A-weighted dynamic range by about 2dB, and achieves a cleaner noise floor. 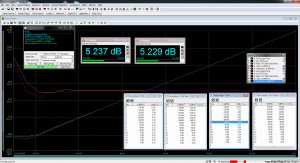 Crosstalk: The PCM5102A’s soft mute function causes a standard crosstalk measurement to produce abnormally impressive results, as one channel is digitally muted. 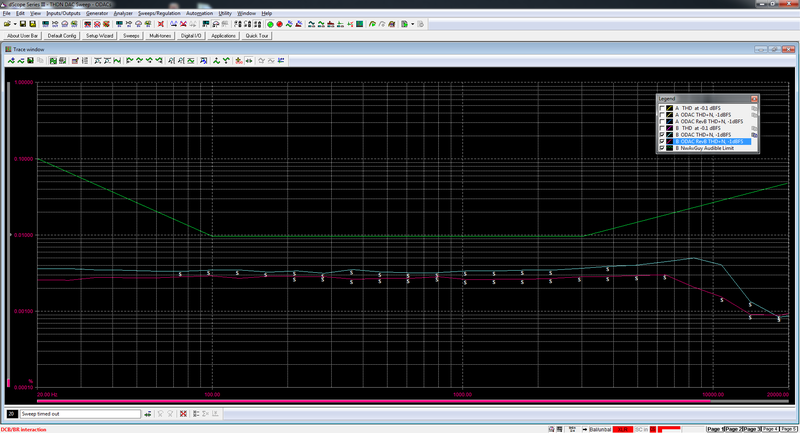 Thus, crosstalk looks substantially superior at all frequencies for RevB. 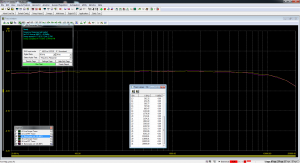 Crosstalk measurements are similar between ODAC and ODAC RevB with a sufficiently small signal applied to the “muted” channel. Also note that the 20kHz “Ch A” test point is invalid for all four curves, as the dScope script conducts the test too quickly during relay initialization. 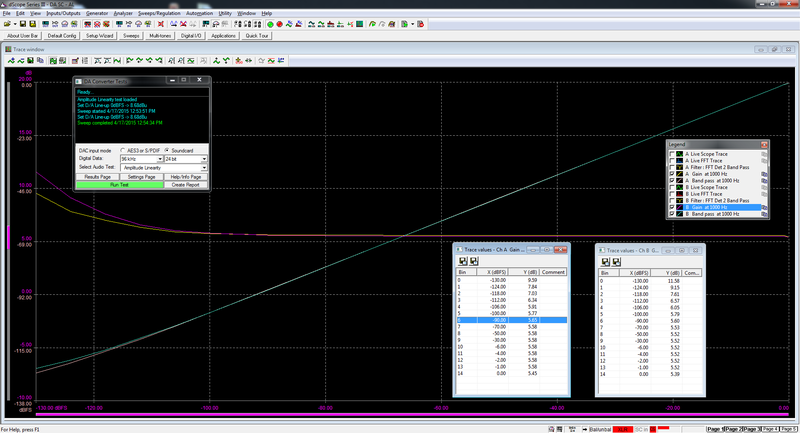 “Ch B” curves at 20kHz are accurate. Jitter: Testing is conducted using an 11025Hz, -1dBFS signal with 8x averaging. Reliability fixes only necessitated a new power supply LDO and DAC IC. We swapped the USB controller for two reasons. First, the SA9023 provides 16/88.2kHz support. Second, its jitter performance is noticeably superior to the older TE7022L. We actually tested a TE7022L+PCM5102A prototype in effort to stay closer to the original ODAC. The SA9023 was ultimately a finer choice. 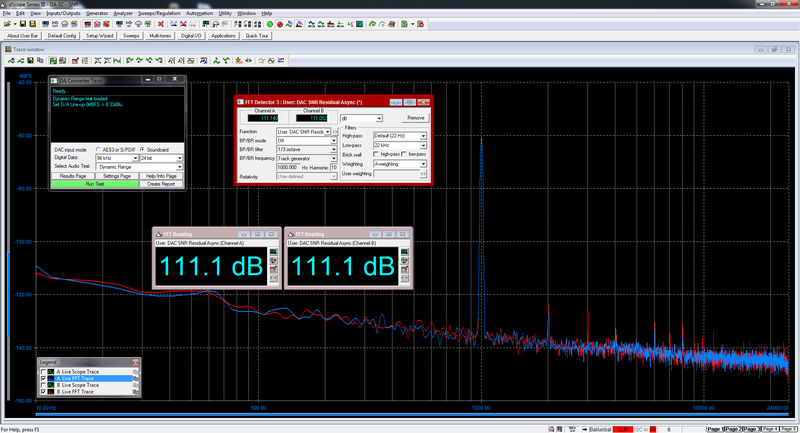 Keep in mind that even the TE7022L produced audibly insignificant jitter (components below -110 dB). 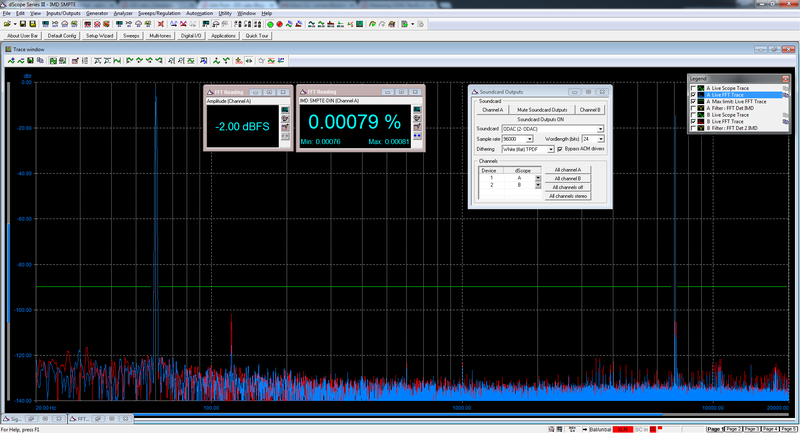 Hopefully 16/88.2kHz functionality adds value to some. IMD SMPTE: The 60Hz/7kHz IMD test returns similar measurements for both DACs: 0.0008% using a -2dBFS signal referenced to 2VRMS. ODAC produces audibly negligible sidebands (below -120dB) within a few thousand Hz of 7kHz, whereas RevB’s distortion shows less jitter but higher amplitude components around the same tone. Note that all of these components are more than an order of magnitude below the audible transparency limit of -90dBFS (green line). 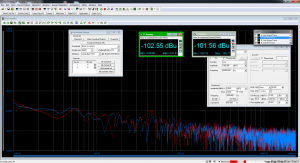 IMD CCIF: Twin tone amplitude is closely matched in the IMD CCIF 19/20kHz test. 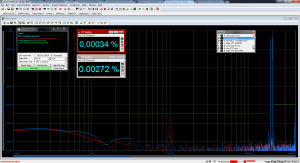 The test returns numerically superior measurements for RevB due to smaller 1kHz components. 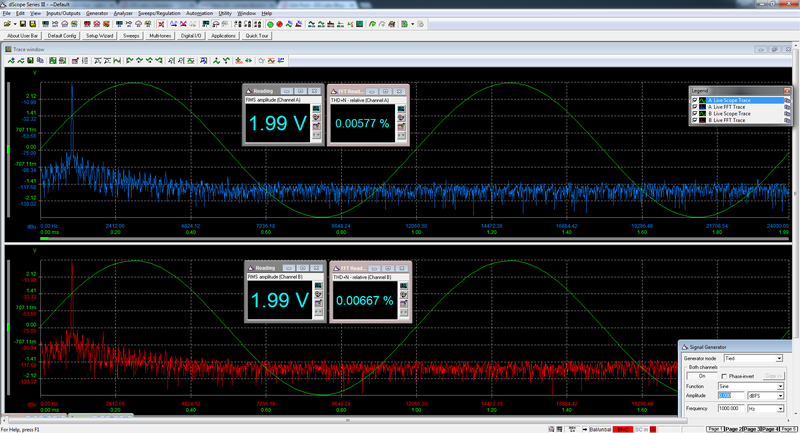 Sidebands are slightly more pronounced from RevB. While sidebands are higher, NwAvGuy prescribed a maximum sideband limit of -90dBr with 2VRMS reference for frequencies below 19kHz, and -80dBr above 20kHz to achieve transparency. RevB meets expectations. The dScope is internally limited to -6.03dBFS for the Twin-tone script. 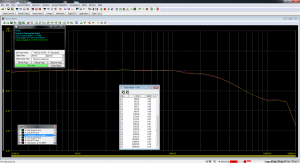 Yoyodyne points out that NwAvGuy displayed a sum of powers and utilized custom scripts when conducting IMD measurements (-6dB + -6dB = -3dB). Linearity: Both versions demonstrate excellent linearity from -1dBFS, down to their respective noise floors. Please note that product titles are unchanged, as performance is audibly the same for both versions of ODAC. For orders placed outside of jdslabs.com, please contact your reseller for availability information. It will take some time for ODAC RevB to make its way to all end retailers. 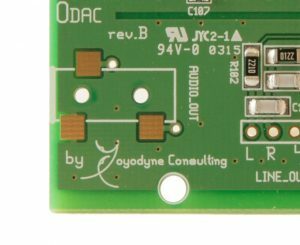 ODAC RevB maximizes long-term DAC reliability, adds 16/88.2kHz support, increases measurable performance, and most importantly, remains audibly transparent. Will the new USB chip make connecting directly to an iPhone with the camera connection kit possible, or is a USB Hub still required? 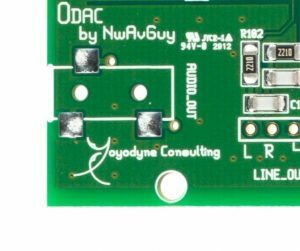 @Harry: The USB controller of ODAC RevB is configured for better compatibility with portable devices. We’ve successfully tested ODAC RevB under iOS 7 and 8 without a USB hub. I have had mixed success with this, my new Objective2 + ODAC rev. B does not work with my iPhone 5S (OS 8.4.1). It works fine with my wife’s iPhone (same model and OS) and our ipad air. @Shootndady: Hm, one would expect the exact same phone and OS version to produce identical results. There’s a small possibility that the physical Lightning connector is making poor contact, resulting in enumeration, but a high impedance supply connection. Inspect the connector closely. Does this new Odac works with ps4?? It’s not very important to me, but, the thought of listening the best audio quality, also with my ps4, would be great!! Stefano: Yes, PS4 has been successfully tested with ODAC. How do I connect and configure my PS4 to work with this, please? If this device works with Ubuntu Linux and PS4 I will buy one right away because those are the kind of devices I use. Thank you in advance and keep up the good work and comunication with customers. Never stop to invest in quality and function instead of products that favour looks and price. I own an Xbox One and PS4 and am glad the ODAC RevB works for the PS4 but does it also work for the Xbox One? I’m in Australia, can you recommend one of your Aussie suppliers for me please? @Al: Rumor suggests that XBox One can connect to DACs, but we have not had a chance to verify at JDS Labs. Does the new ODAC work with the Samsung Galaxy S6? Bryan – We’ve heard from a few S6 owners recently, and I believe ODAC will connect (we have not been informed otherwise). That said, we do not have a Galaxy S6 in the office to confirm. what about mic input and game chat when using on ps4 any word if mics will work when using this ? @shaun: ODAC is an output device (headphones only). You can continue using your mic through the PS4 and adjust game/chat volume through the PS4 menu. The Mixamp will allow you to adjust volumes quickly, while O2 will boost your headphone listening. Can I connect ODAC with Mp4 Player (like Cowon J3) and listen with headphones? Yavor: You can use ODAC with any device that supports USB audio. Cowon’s J3 does not seem to have such support. Is O2+ODAC able to work on PS3? If yes, how to set-up? I can fill Humming noise inflow. only My ODAC rev B’s problem? or every ODAC rev B has same problem? @Choi: What amplifier connects to your ODAC RevB, and how is your amplifier powered? You may be experiencing ground loop noise. To eliminate ground loop noise, try a galvanic isolator with your DAC, or use a ground loops isolator at its output. Galvanic isolation is preferred. Search for “ADuM4160 USB isolator”. Would this one works fine with ODAC rev B? Can I ->Do I need Grounding? May the galvanic isolator can solve the problem with this conditon? I’m not so sure about this optimized compatibility on the revB board … Using an OTG usb cable, I wasn’t able to put any music through the RevB Odac using android devices (Nexus 10, LG G2) … WinPC works fine. Patrick – Yes, Android compatibility continues to change. Try a USB hub. We’ve found that some Androids incorrectly disable 5V power to to OTG devices (as in 0V supplied). ODAC RevB requires USB power, and I can confirm that stability is near 100%, as promised. This was not the case with ODAC RevA. Ok, thanks for the prompt feedback, I’ll give your suggestion a try. I am the happy owner of O2 with ODAC rev.B built in. Maybe it would be interested for you, that I did small mod while installing the daughter card – I managed to maintain battery operation of O2 while putting the ODAC inside (in the standard O2 box)! And also avoided cumbersome cable routing of the audio out (odac) to audio in (o2) – in my case cables do not need to cross to the other side of the PCB, thus connection may be done with shielded audio cables (no need for utp swisted pair as per original suggestion from nwavguy). With the very small modification of the production ODAC board: changing mounting holes placement and making the board smaller by 1mm (on the longer edge) – the way I installed the board would be possible to anybody, without any modification, opening the choice for more flexible device. Maybe you may consider those changes in the future yearly pcb batch production? I can provide you the photos, if you have not figured out how I had done it yet (unlikely). I use my O2/DAC mainly as portable device – either with my laptop as dac+amp or with my Bluetooth audio adapter as headphone amp. Is there any information available about which of the two PCM5102A interpolation filters this DAC uses? The relevant spec sheet seems to show a linear phase and a minimum phase filter. But there’s nothing I could find in the description of ODAC rev B regarding which of these filters is in use. In my experience testing a great many DACs, the filters in use can make an audible difference in some tracks that doesn’t get picked up by the standard audio measurements. From discussions with some audio engineer friends, these differences likely amount to subtle phase shifts. Due to the controversy in the scientific community regarding the audibility/inaudibility of such shifts and the lack of a generally accepted way to measure them, phase distortions from, e.g., DAC interpolation filters will not necessarily be visible in the ODAC’s measurements, because one isn’t “supposed” to measure for them. But having personally tested different filters (including some DACs that have selectable filters), I can confidently say that the difference between them in some tracks is immediately and obviously noticeable. The changes manifest almost entirely in terms of perception of where sounds are located within the stereo field, as well as the perceived timing of reflections, both of which strongly contribute to that ephemeral, subjectivist notion of “soundstage.” The version of “Blue Calx” by Alarm Will Sound is a particularly revealing reference for this phenomenon, but I (and many others) can hear differences on other tracks as well. A recent whitepaper from a rival DAC manufacturer discusses this potential phenomenon as being a reason why some people claim to hear a difference between high sample rate audio and 44.1kHz audio; the higher sample rates may suffer less phase distortion upon conversion to the DAC’s native rate and thus may end up sounding “more natural” despite the inaudibility of the ultrasonic frequencies. This is certainly a provocative assertion, as there may be no predictable relationship between a given sample rate and a resulting phase distortions. Also, it contravenes that one well-known double-blind study in which people secretly snuck ADCs/DACs into signal chains through which supposed golden-ears were listening to high-sample-rate audio. Nevertheless, my personal experience has convinced me that different oversampling filters can—sometimes drastically—alter perceptions of soundstage. (And maybe they can change perceptions of other things like “bass texture” that subjectivists like to prattle on about.) Perhaps not coincidentally, a rival DAC maker offers a line of products with a proprietary “closed form” oversampling filter, run in an onboard DSP, which filter in theory produces none of the ringing artifacts and other “unwanted garbage” that conventional filters inevitably produce. I have no idea whether that filter interacts with the DAC in a way that really does minimize phase distortion, but those DACs certainly do sound more “three dimensional” than anything else I’ve heard. TL;DR: If you guys choose to do ODAC Rev. C one day, please bypass the DAC chip’s built-in filter and use an ASIC that runs a closed-form oversampling filter instead. I think this could be done, in volume, for a price similar to the existing ODAC’s price, and it will help realize the original goal of ODAC: total transparency. so what you think it will work or is just theory? We’ve also only tested PS4. The advice you’ve already received is correct. An amplifier (Objective2) is a good way to boost output from an Astro MixAmp. A DAC will only complicate connectivity; you’ll want to continue using the MixAmp for best control of game and chat volumes. In other words, the MixAmp’s ADC & DAC is better suited to gaming than a 2-ch output DAC. Connecting my iPhone 7 direct to ODAC Rev B via CCK = Perfection!!! If the CCK is truly a totally digital connection, why is the volume output from it still controlled by the volume buttons on the phone? Why is it different from your testing? Hi Yue – Different test configurations cannot be directly compared. The results you linked were conducted at 12kHz, 24/48k (0dBFS? ), while the 2015 measurements above were taken at 11025Hz, 24/96k (-1dBFS). It’s expected to see different results under different test parameters. There are near endless ways to setup an audio analyzer. As with any benchmarks, always be sure to check the test config before comparing a set of results. Edit: FWIW, the -95dB idle tone in the linked discussion is unusual. I’ve never seen such behavior from an ODAC at any sampling rate. This might be caused by full scale, 0dBFS, testing. Just a guess. Will be glad to investigate more. Probably you can try to match his parameters as close as possible and have another test (and please let us know the result!). Could you reproduce this issue now? Is it caused by 0db vs -1db testing? Do you have test with any Android device? Please recommend me some Android device which worked with ODAC RevB. I’m far away from you therefore i’m considering. What tests would you like to see? Oh sorry, I’ve just found the answer above. I just wondering which Android mobiles are compatible with ODAC RevB. I have one more question — I have an ODAC + O2 combo with rear RCA output. Is it possible to use rear RCA output port as the input of the amp and bypass the ODAC? I tried that but it seemed the sound has very high distortion.